Do you plan your meals (or at least, your shopping list) based on what’s currently on sale? I usually do. My feeling is, why pay more if you don’t have to? Plus, we have two refrigerator/freezers, so we have space to store what we don’t use right away. Then, I work with what I have and either use existing recipes, or find new ones to try. So tonight, it was london broil. I’m still not feeling 100% so I didn’t want anything too complicated – which usually equates to using the crockpot. Fortunately, I found a recipe online that didn’t involve anything too “pot roast-ish” or adding cream soups. It was delicious – the meat was very tender which is tough when it comes to london broil. And, instead of thickening the broth so it became more of a gravy, I saved it (with the onions, of course) for soup, which will probably involve some sort of melted cheese on top, a la French Onion. Also, I made my friend Megan’s famous baked macaroni & cheese last night, and put it right in the fridge – so all I needed to do was reheat it. It rocks! It’s her grandmother’s recipe and she’s been making it forever. It’s SO easy, and you gotta love your Le Creuset during times like this when a dish goes from stove to oven. Makes it even simpler. Plus, it’s inexpensive and makes a LOT, so you can feed a lot of people, or freeze what’s left. Have I mentioned how much I LOVE CHEESE?? Next time I’ll be making this with different varieties…this version was all sharp cheddar. And it was goooood. Side note – please, if you aren’t already a fan of mine on Facebook, go to my page and “like” me…and pass the word along to your friends. The next giveaway will be announced when we hit 350 fans. Let’s make it happen SOON! Season the meat with salt and pepper. Make slices in the meat large enough to fit the garlic pieces, and stick them in the holes. Place one onion in the crockpot, then the meat, then the rest of the ingredients on top. Cook on low for 4-5 hours. In medium saucepan combine first three ingredients – stir in milk. Add butter, stirring constantly over medium-high heat until sauce thickens. Don’t stop stirring or it will scorch! Remove from heat. Stir in 2 1/2 cups cheese until melted. 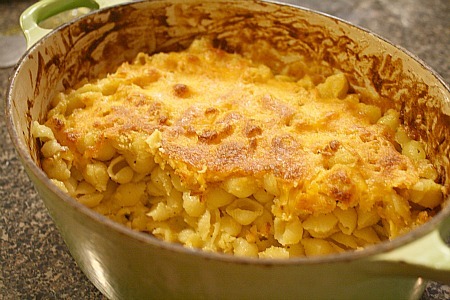 Add macaroni – pour into 2 quart casserole dish. Sprinkle with remaining cheese and breadcrumbs. Bake uncovered at 375 degrees for 25 minutes or until lightly browned and bubbly. Makes 4 servings. This entry was posted in beef, cheddar, cheese, crockpot, low carb, main dishes, make ahead, pasta, QuickAndEasy, side dishes. Bookmark the permalink. Hi Melissa, I am looking forward to making this M&C recipe for a cookout next weekend. For the cheese- would you recommend I purchase a brick cheese (and shred it) or using pre-shredded cheese (from a bag)? Oh perfect- was hoping I could get away with pre-shredded cheese. Thanks again, can’t wait to make! I made the London broil tonight in the crockpot it was really good! I would also like to make soup out of broth. How did you make the onion soup with it? I would love to try that!